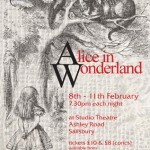 Salisbury Studio Theatre is run entirely by its members, on a voluntary basis. If you want to be part of Studio Theatre, but do not want to act, there are many opportunities for you to help out with the vital and rewarding responsibilities listed above. Every Salisbury Studio production normally requires between ten and fifteen people to help run a show, from the box office, bar (catering), stage management, props and actors, and running the lighting and sound equipment. In addition, there are numerous opportunities to help with the production, from designing, building and decorating the set, as well as distribution of publicity material, i.e., posters, flyers etc. Guidance is provided for all these responsibilities, and you will not only meet similarly enthusiastic people but also become a valuable part of Studio Theatre. So what are you waiting for? Join today and let’s get on with the show.